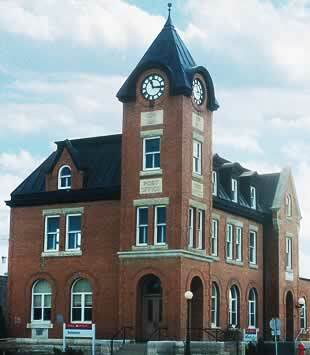 The Battleford Post Office is the oldest operating Post Office in the Province. Constructed of Georgian style with red-brick in 1911, the sight of this four storey building will take you back to the beginning of the twentieth century. Located at 191 - 22nd Street West, the Battleford Post Office is the oldest continuously-used post office in the Province and the second oldest continuously-used post office in all of Canada. In 1914, the town clock was installed, and began it's record of the past into the new millennium. In 1987 a 72 cent stamp was made to commemorate the heritage value of the Battleford Post Office.